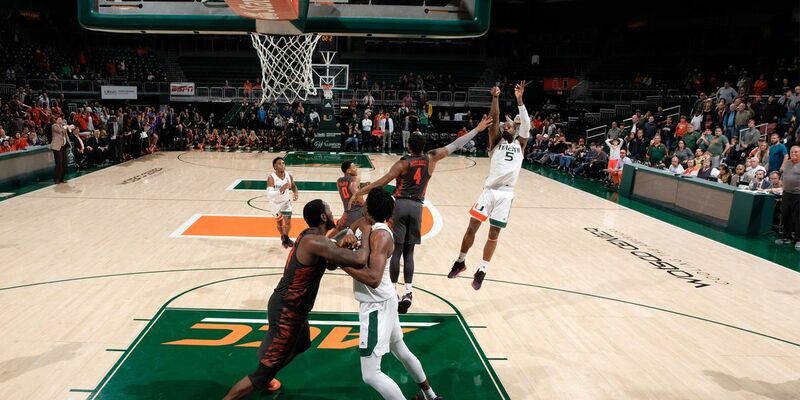 MIAMI — Clemson University men’s basketball overcame a 10-point deficit in the second-half and held a one-point advantage but were beaten at the buzzer to fall by one at Miami. The Tigers (15-9, 5-6 ACC) were led by three double-digit scorers, including Marcquise Reed’s team-high 19 points. Reed finished a perfect 9-for-9 at the foul line. Elijah Thomas finished with 16, while Shelton Mitchell posted 15 in the loss. Thomas grabbed a game-high nine rebounds. Clemson held a two-point advantage at halftime and took a three-point lead with 17:13 left in the second half following an Aamir Simms 3-pointer. Up by three, the Hurricanes (11-13, 3-9 ACC) then engineered a 13-0 run to take a game-high 10-point lead. The Tigers clawed back and finished off an 8-2 run with two free throws from Reed to take a 64-63 lead with 1:11 left in regulation. Miami’s Zach Johnson got a highly contested shot to drop with 0.4 seconds remaining to clinch the win for the Hurricanes. Clemson returns to the floor on Saturday, Feb. 16 when it travels to No. 16 Louisville for a 12:01 p.m. tip from the KFC Yum! Center. Notes: With 15 points Shelton Mitchell surpassed the 1,000-point mark of his Clemson career (1,001) and now stands 41st in scoring in Clemson history … Elijah Thomas now has 159 blocks in his Clemson career – 18 shy of tying Sharrod Ford (2001-05) for ninth on the all-time list … Thomas grabbed nine more rebounds and now has 572 for his Clemson career – just 32 shy of tying Horace Wyatt (1978-82) for 25th all-time … Marcquise Reed tallied another steal and now has 146 in his Clemson career – five shy of tying Andre Bovain (1990-94) for 12th on the all-time list … Reed’s 19 points give him 1,278 for his Clemson career – 30 shy of tying Sharone Wright (1991-94) for 21st on the all-time scoring list … it marked Reed’s 61st double-digit scoring game at Clemson – leaving him nine shy of tying Butch Zatezalo (1967-70) and Larry Nance (1977-81) for 16th all-time in program history … after finishing 9-for-9 at the free throw line, Reed has now made 16-straight free throws – a season-high for a Clemson player this year.